Stumbled upon this indie (Independent) game the other day on steam. Couldn't pass this game up so I downloaded the demo and tried it out. Then as I played thru, it struck me on why the developer would implement such a function. SHE MOVES AWFULLY SLOW. Touche' you sneaky Indie devs. The Graveyard can be downloaded at http://store.steampowered.com/app/27020/ you need to download and install the Steam client beforehand though. Oh also from now until the 25th of May, Steam is giving free copies of Portal to commemorate their expansion to Mac platforms. IGN.com honored Portal with several awards, for Best Puzzle Game for PC and Xbox 360, Most Innovative Design for PC, and Best End Credit Song (for "Still Alive") for Xbox 360, along with overall honors for "Best Puzzle Game" and Most Innovative Design. In its Best of 2007, GameSpot honored The Orange Box with 4 awards in recognition of Portal, giving out honors for Best Puzzle Game, "Best New Character(s)" (for GLaDOS), "Funniest Game", and Best Original Game Mechanic (for the portal gun). In Official Xbox Magazine's 2007 Game of the Year Awards, Portal won Best New Character (for GLaDOS), Best Original Song (for "Still Alive"), and Innovation of the Year. 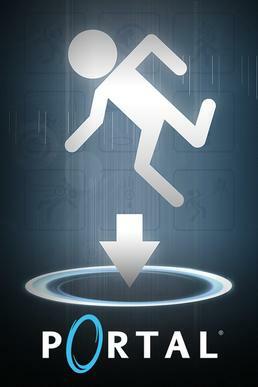 In GameSpy's 2007 Game of the Year awards, Portal was recognized as Best Puzzle Game, "Best Character" (for GLaDOS), and "Best Sidekick" (for the Weighted Companion Cube). A.V. Club called it the Best Game of 2007. So there's no excuse on not getting it. Totally recommended due to it's unique gameplay as well as storyline with a twist to its ending. Also you'll finally get in to "The cake is a lie" joke that's been going around the web for ages. SO WHAT ARE YOU WAITING FOR? GO GET IT NAO! Yes I'm talking to you sam.